FOR SALE: 2018 Blowout Sale! Conquest Motor Homes are famous for affordable family fun, of course - But more than that, they're built with a 35-year legacy of quality and innovation that promises years of unforgettable vacations and priceless memories. Think of all the places your family could go and the things they could see - All in the comfort of a home you can call your own anywhere the road leads. 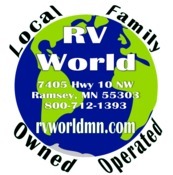 Browse our selection of New Travel Trailers, Fifth Wheels and Motorhomes for sale at our dealership near Minneapolis, MN and St. Paul, St. Cloud, Shakopee, and Duluth, Minnesota. We carry some of the most trusted brands in the industry like Gulf Stream, Palomino, Heartland, Fairmont Homes Inc, and Forest River. Whether you want an affordable Toy Hauler that doesn't skimp on the luxurious amenities of a Fifth Wheel like a New Heartland Torque or you're looking for fun retro looks with modern options like a New Gulf Stream Vintage Cruiser, we're sure to have the New or Used Travel Trailer, Fifth Wheel or Motorhome you're looking for. Stop by our dealership today and let one of our friendly and professional sales staff help you find the RV of your dreams. We proudly serve the areas of Minneapolis, MN and St. Paul, St. Cloud, Shakopee, and Duluth, Minnesota.